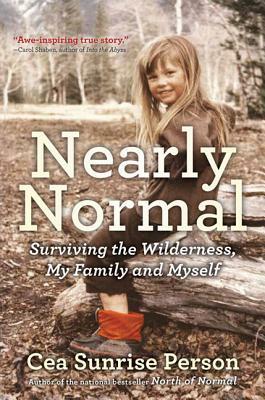 I read Nearly Normal: Surviving the Wilderness, My Family and Myself by Cea Sunrise Person and I survived. Opportunities for do-overs are exceedingly rare in publishing, as in life. Yet Cea Sunrise Person has been given that opportunity, and with Nearly Normal has written a book that revisits and updates her first memoir, North of Normal: A Memoir of My Wilderness Childhood, My Unusual Family, and How I Survived Both, HarperCollins, 2014. Both books explore her nontraditional childhood and its reverberations through her life. I was assigned to read Nearly Normal as part of preparation for my MFA-Creative Nonfiction residency at University of King’s College-Halifax, because Cea Person is our writer-in-residence this year. Students were assigned to write a 500-word response to Person’s book. This is what I didn’t say in that essay. Nearly Normal is essentially a memoir about the aftermath of publishing her memoir, an interesting premise. It compelled me to read North of Normal. More of that book is based on interviews with people about the years Cea was too young to remember, and I find her writing in North of Normal more agreeable. This book falls squarely in the genre of the “Awful Childhood Memoir,” joining the acclaimed Frank MCourt’s Angela’s Ashes and Jeannette Walls’ Glass Castle, plus favorites of my own such as Jill Ker Conway’s The Road from Coorain and Alexandra Fuller’s Don’t Let’s Go to the Dogs Tonight. And many more. (This is a crowded genre.) Certainly the weirdness and deprivation of Person’s early years hold their own against all comers. The conflict that gives both of Person’s memoirs their forward motion is her desire for conformity to a “normal” with only the vaguest idea of what defines “normal,” confounded by her distrust of her own intuition and instincts. A secondary theme in both her memoirs is motherhood/what constitutes appropriate “mothering.” Here, Person falls too often into the trap of passing judgment. As Tristine Rainer says in Your Life as Story (Tarcher/Putnam 1998), “Judgments stop the unlayering of character and block our engagement with life’s mystery, including the mystery of evil…. If you include all sides of a person, the dark and the light, then it is possible to tell even ugly truths about someone without committing character assassination—if your motive is not to condemn but to understand.” Person has a legitimate bone to pick with her mother—and her whole family of origin—but fails to restrain herself from passing judgement in her writing. As a reader I feel her motive is to condemn. I find Person’s writing best when she is reporting events in scenes, especially scenes based on interviewing others. Person’s writing is at its worst when she is reflecting on her sense of betrayal by her family. Reading Nearly Normal, I was continually hoping to get away from current-day Cea, whom I found an unreliable narrator, and to spend more time with child-Cea, whom I found appealing and resilient. Today, 40-something Cea is an author, teacher of memoir writing, wife, and mother, happily “normal” at last. Her book is ultimately about the search for acceptance—by outsiders, by family, and finally, oneself. I am glad Person found the healing that expressive writing can bring, transmuting her pain into art. That is the real message of this book–if Cea can do it, so can you. Now, how did I feel about Cea’s role as writer-in-residence at the 2017 U-King’s MFA-Creative Nonfiction residency? I’ll save those thoughts for another day. This entry was posted in Book review and tagged #mfa. Bookmark the permalink. Thank you for sharing this article you wrote. It reminds me and clarifies part of why I want to write my stories besides reaching out to others who’ve had similar experiences so they don’t feel so alone and left out as well as have hope. My memories, my therapy, is not about blame or making excuses. It’s about trying to understand, and from that attempt to understand, what guides other people to say or do what they do. To gain empathy and through empathy, compassion and forgiveness or at least tolerance. To seek the good, the ‘hidden treasure’ of talent or kindness some of us have had to distance ourselves from or deny in order to survive. Anyways, thank you again for writing and posting. I’ll look for and check out from the library both these books as well as others you mention to read and think about. Thank you also for your writing classes which I have enjoyed.